Challenging year with 2% organic growth and €488m EBITDA for Ingenico. In line with January 22th, 2019 communication. Improved revenue trajectory in the second half 2018 with 6% organic growth 2019 EBITDA above €550m with a FCF conversion at c. 50%. Launch of Fit for Growth transformation plan. Ingenico Group (Euronext: FR0000125346 – ING), the global leader in seamless payment, today announced its 2018 full-year results. As the new CEO, I am very proud of leading Ingenico, which enjoys leading technologies and positions in integrated payment solutions. 2018 has however been a challenging year. I have now assessed key issues faced in 2018 and set up a new seasoned and international management team to drive the company repositioning. The Group is already in motion to deliver a 2019 EBITDA above €550 million. Retail performance will be sustained by ongoing deployment of our direct access to merchant’s strategy, and strategic growth initiatives. B&A performance has been affected by adverse market conditions and lack of execution in mature countries in 2018. B&A is thus being repositioned and optimized to benefit from ongoing opportunities such as recovery in Emerging Countries or deployment of Android. Ingenico management team will also be very focused on executing the Fit for Growth transformation plan, together with renewed attention on cash-flow generation. We are looking forward to detailing our new strategic plan during a Capital Markets Day on April 24th”. Over the year, Banks & Acquirers posted a revenue of €1,305 million, a decrease of 4% on comparable basis, but returning to a slight organic growth of 2% in the second semester. On a reported basis the activity decreased by 8% and was including a negative foreign exchange impact of €62 million. The Retail Business Unit reported a revenue of €1,339 million, showing an increase of 8% over the period on comparable basis, with a strong organic growth acceleration in the second semester reaching double digit. On a reported basis, revenue increased by 22% during the year and was including a negative foreign exchange impact of €48 million. The Banks & Acquirers EBITDA stood at €277 million, down from €371 million last year. It represented a 21.2% EBITDA margin, down 4.8 points compared to the 26% pro forma EBITDA margin of 2017, significantly impacted by the negative geographical mix. The Retail EBITDA came in at €210 million, up 18% versus last year. The margin this year represented 15.7%, up 1.9 points compared to the 2017 pro forma EBITDA, driven by the repositioning of the business unit carried out over the past two years. The financial results account for €-38 million compared to €-27 million in 2017. Income tax were reduced to €52 million in 2018 from €86 million in 2017. This improvement is mainly explained by the US tax reform and a more favourable change in the country mix. Those changes led to an effective tax rate for the Group of 21.5%, against 25.0% in 2017. In 2018, Group net profit attributable to shareholders came in at €188 million, against €253 million in 2017. 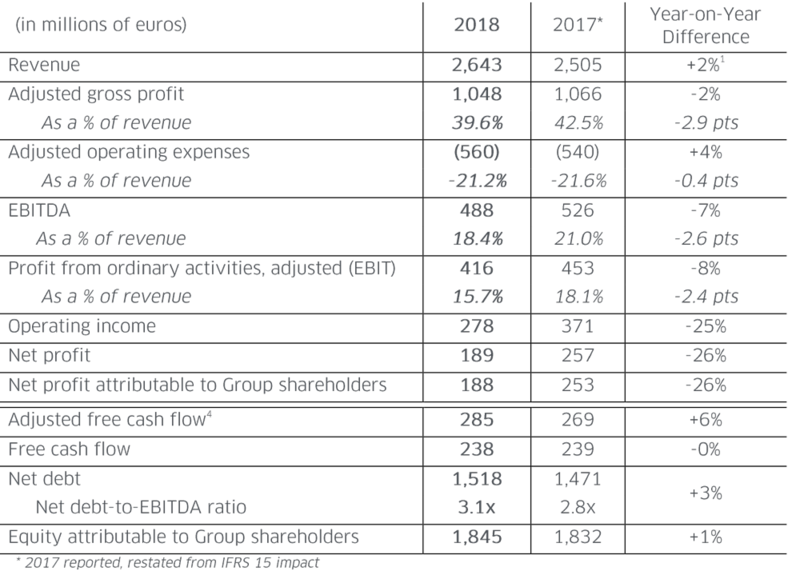 The adjusted free cash flow4 was up 6% in 2018 at €285 million, i.e. a conversion rate of 59%. The group’s operations, post other income and expenses, generated a free cash flow of €238 million, i.e. an FCF/EBITDA conversion ratio of 49%. The capital expenditures increased as expected to €117 million against €88 million in 2017. The Group’s net debt increased slightly to €1,518 million against €1,471 million one year ago. This was mainly due to the purchase of the 20% stake in Ingenico Holdings Asia Limited, that of Airlink and €87 million of Ingenico’s shares buyback. The ratio of net debt to EBITDA is up to 3.1x from 2.8x at the end of 2017, but down from the first half of 2018 that landed at 3.6x. In line with the Group’s dividend policy, a proposal to distribute a dividend of €1.10 per share will be presented to the Annual General Meeting of shareholders on 11th June 2019, representing a distribution rate of 36%. This dividend will be payable in cash or shares, according to the holder’s preference. SMB (up 20%): The division has delivered a very strong performance even accelerating in the second semester through a continued expansion of the merchant base as well as an increase in transactions with acquiring volumes growing by more than 30% during the quarter. In particular, the performance of SMB in Germany accelerated significantly over the quarter while gaining new clients and retaining its existing client base. The performance of this business will be recognized in the newly created Payone division in 2019. Global Online (up 8% ): The quarterly performance was in line with our expectations, benefiting from the boarding of new clients during the past quarters. Moreover, the division benefited from the continued momentum around some specific commercial events such as Single Day or Black Friday. The activity remained very strong in India, growing over 20%. During the quarter, the division announced a new global device fingerprinting solution and a new ACH solution (direct debit solution) in the US, and launched a new full service solution in Russia. New customers were signed over the quarter in the gaming sector (Kiwi Games) and the Online Travel Agency sector (Trip A Deal, eDreams). Enterprise (0%): The Q4’18 activity was in line with our expectations. The strong performance of our Western European instore gateway, i.e. Axis offsets the expected decline of our German OLV business. The hardware business performed well during the quarter, with a normative performance in Europe despite some macroeconomic headwinds which continue to impact the Turkish terminal activity. The rest of the activity remained driven by a very strong dynamic in North America, benefiting from renewal from large US retailers. Europe, Middle-East & Africa (down 21%): The division has carried on experiencing operational challenges in Q4’18 as well as a high comparable basis since Iran revenue in Q4’17 were representing €15 million of revenue, explaining half of the decline quarter on quarter. The region has experienced a slow down the decision process of some of our major clients in the Nordics and in the United Kingdom as well as a lack of execution in some mature countries. Nevertheless, the sequential performance of the division has stabilized on a quarterly basis. Asia-Pacific (up 12%): The quarterly performance was in line with the third quarter’s activity. In Asia, all markets expanded significantly apart from Thailand as the terminalization process ended as expected. Japan has delivered a strong quarterly growth as Ingenico Group capitalizes on its certified products and the ongoing EMV migration. India is now completely back on positive trend after the strong 2017 comparison basis, China outperformed expectations in Q4’18 with robust demand for APOS products in the last weeks of the year and Indonesia demonstrated its ability to maintain its leadership with the largest acquirers. The dynamic in Australia has been driven by the ongoing Telium Tetra deployment which will be a driver for 2019 as well. Latin America (up 61%): As expected, the division performed very strongly in Brazil in Q4’18, even accelerating from the Q3’18 performance year-on-year. Ingenico Group has massively increased its market share by partnering with most of the local acquirers selling its comprehensive range of products, including Android terminals such as the APOS. Moreover, the Group has developed, together with some of the largest acquirers, a Direct Sales model in which Ingenico Group sells the POS directly on behalf of the acquirer. Mexico remains a very promising market where Ingenico Group continued to grow during the quarter. The Group has benefited from the certification of Telium Tetra as well as the development of the hardware services in the country. The operations remained particularly strong in Colombia, Peru and Chile. North America (down 13%): The B&A performance in North America was largely impacted by a base effect due to two significant orders placed in Q4’17. Moreover, the activity has been impacted by the lower than expected contribution of EMV renewals in the United States which was slowed down by a longer certification process. In 2019 the Group expects to benefit from the Telium Tetra deployment to US-based clients and from different EMV renewal projects in the second half of the year. B&A in Canada experienced a very strong quarter driven by the deployment of Telium Tetra. Improve operational efficiency and streamline G&A through a leaner and more agile organization, the optimization of the Procurement & IT and the consolidation of Data centers. Revenue: the group expect expects to achieve an organic growth of its revenue between 4% and 6% with B&A revenue flat compared to last year and Retail growing at double digit organic growth. a negative impact from currencies of c. €5 million. Free cash-flow: the group has the ambition to reach a free cash-flow conversion rate of c. 50%. The 2018 full-year financial results will be discussed in a Group telephone conference call to be held on 12th February 2018 at 6.00pm Paris time (5.00pm UK time). he call will be accessible by dialling one of the following numbers: +33 (0) 1 72 72 74 03 (from France), +1 646 722 4916 (from the US) and +44 20 7194 3759 (from other countries) with the conference ID: 31784581#. EBITDA is not an accounting term; it is a financial metric defined here as profit from ordinary activities before depreciation, amortization and provisions, and before share-based compensations. Up 11% adjusted from the IFRS 15 impact in Q4’17. Global Online is up 8% organically on reported figures.